This review will contain spoilers for Batman V Superman: Dawn of Justice. There will be some minor spoilers for Justice League, but they will be blurred out until clicked on should you choose to avoid them. At the time I’m writing this, Justice League currently sits on Rotten Tomatoes at 40%. Surely, this is a giant disappointment to DC Comics fans and executives alike. As I ordered some popcorn and a Cherry Coke before the show this morning, the two employees behind the counter asked what I was seeing. When I told them, they both were enthusiastic in saying, “It’s a good movie. The critics were too hard on it.” Well, I’ve come out the other side. Who’s right? The critics or the concessionaires? On the whole, the movie’s kind of a mess. It was directed by two different people and it shows. Tonally it feels a bit strange. Zach Snyder started the film and it was finished by Joss Whedon1. The two men could not possibly have more diverse approaches and it shows. Without knowing the production history, I might’ve actually been able to guess that Joss Whedon punched up a script by Zack Snyder. That’s exactly what the film feels like. It also suffers from a nasty case of telling rather than showing. We’re told repeatedly how the world has gotten dark since Superman’s death in last year’s Batman V Superman: Dawn of Justice, only we never really see that in the film anywhere. Honestly, in comparison to Bats vs Supes, the world feels brighter. That’s the problem with Zack Snyder’s obsession with making things dark and gritty at all times. Where do you go when you actually need the world to be darker? Not to mention that there is plenty of darkness going on in our world right now that could have been tapped into. Every day we’re hit with news of a new scandal, a new tragedy, or a new controversy. People have a serious dearth of hope. We know what that looks like when a culture feels it, so why isn’t it on the screen here? The film is another one from Snyder’s DC that feels like it came a decade or more too late. 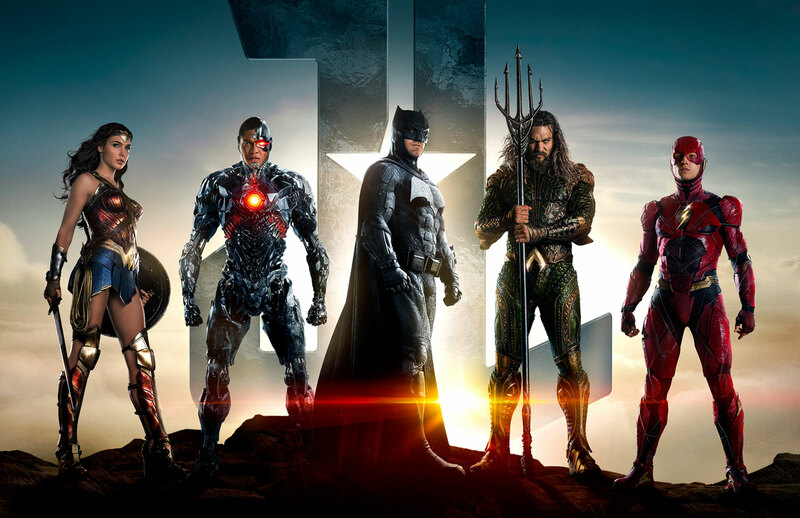 Around the time of Batman Begins, we were in the throws of “dark, gritty reboot” season.2 This Justice League would have fit in around that time. It might have been even better received. Now, it just feels out of place. At one point in the film, Bruce admonishes Diana for hiding in the shadows and not being a beacon of hope like Clark was. That her job is to be there to empower people and encourage them. I wanted to yell at the screen at this point. That’s exactly the problem with the movie! That’s why people are so frustrated with the DC films! They took these characters that were supposed to represent the best of us and knocked them down a peg or two. The villain of the film, Steppenwolf, is an improvement from Batman V Superman’s Luthor/Doomsday combo and Suicide Squad’s Enchantress, but is pretty generic. He’s a destroyer of worlds3 and he wants to destroy Earth next. He feeds off fear and hate and with Superman’s death, fear and hate are at all time highs, so it’s his golden opportunity. It’s a simple plan that gets communicated pretty quickly and it makes sense. I’ll take it. At least this time he has motivations that at least sort of make sense and his plan is easily understood without needing to break out a whiteboard. The problem is, he’s just so boring. Ok, he’s a big bad dude, he wants to kill the planet. Yawn. There’s a failed attempt to put some human stakes on it by introducing us to a random family apropos of nothing, but I never felt invested in what was going on. It was another case of a superhero movie falling into the “sound and fury signifying nothing” trap that is so easy to get wrapped up in once the evil sky beams start sprouting. What the film does have going for it, however, are stellar performances from our cast of heroes. Affleck does a great job as grumpy Batman again, making me legitimately look forward to a solo film featuring the World’s Greatest Detective. Gal Gadot is a great Wonder Woman and it’s no different here. Henry Cavil continues to be a genuinely great Superman. The two name brand additions to the team, Aquaman and The Flash, deliver big time, as well. Previous to Justice League, I would have had absolutely zero interest in seeing an Aquaman movie, but now I’m totally into it. Jason Momoa is having such a great time in the role, I could easily watch a solo adventure starring him. Ezra Miller’s Barry Allen is also a great addition. The two characters inject a bit of levity into a film that needed it wherever it could get it. I had a good time with the film largely, I think, due to the cast knocking it out of the park in their roles. Whedon’s ability to bring an ensemble cast together in fun ways seems to be on display here. They seem to be having a good time and it makes me want to spend time with them. The film moves along at a good clip and never left me checking my watch, something I find myself doing even during films I’m genuinely enjoying these days. The film is also incredible to look at. The production design of the different cities is breathtaking, particularly Gotham. Unfortunately, the final battle takes place in a reddish, Mars-like wasteland that’s rather mundane, but the environments we spend time in along the way are spectacular. There were several shots that looked like they came right off the page or would look great in a frame. The neon-baked Gotham rooftops, the wave-ravaged shores of Scandinavia, the lush greenery of Themyscira; the different settings stand out and look wonderful. Is it a great movie? Of course not. There are various problems with it on a fundamental level. If you’re interested at all in the subject matter, however, I think it probably is worth your time. There is fun to be had here. If you have to choose only one superhero film to see this weekend, though, make it Thor: Ragnarok. Ok, so we obviously got cameos from Zeus and a Green Lantern, but did I also spot Superboy at Superman’s grave laying down a wreath? All of Batman’s talk of having a “contingency plan” made me wonder, might they possibly be teasing a Tower of Babel event down the line? If so, count me in. Steppenwolf name checks Darkseid at one point, but I can’t help but wonder why. Where do you go from trying to destroy the world? Anyone else get a real Wizard of Oz vibe from the henchmen? That just me? It has its flaws, but, all in all, I enjoyed it. Sure, this isn’t going to come close to cracking my Top 10 list this year, but overall Justice League is an entertaining superhero adventure.